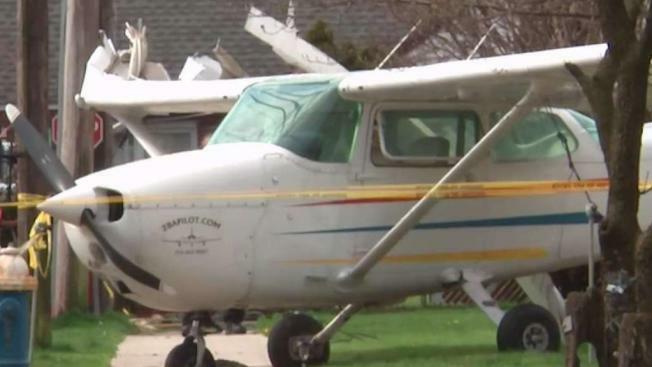 A small plane crashed on the lawn of a Long Island home, but no one was seriously hurt. Greg Cergol reports. The three passengers of a small plane made a lucky escape late Sunday after they ran out of fuel, clipped power lines and came down nose first in the yard of a Long Island home. Between the pilot and his two passengers, who were returning from a day in Niagara Falls, the only injury among them was one sprained finger. Nassau County authorities said the plane first tried to land at Republic Airport, missed the runway four times, then diverted to JFK, where it missed the runway twice. After finally running out of fuel, Nassau County Police Commissioner Patrick Ryder told a news conference, the plane clipped the roof of a church and then hit power lines on Clarendon Drive in Valley Stream. Authorities found the three men, all under 30 and from Flushing, sitting on the side of the road. Roughly two dozen homes were left without power by the crash.